“What a sight!”, Ralf calls when we approach the yellow painted new building. We high five. In a way, for both of us, a circle closes on this day. At the beginning of May 2015, a week after the quake, the 56-year-old mountaineer had driven with a team of doctors to the worst-hit district of Sindhupalchowk, where also Thulosirubari is located. “Where once was hubbub, is now ghostly silence. The people are standing around staring at the ruins of their homes. They do not even know where to start to clean up,” Ralf had told me at that time, adding that the old school was “just a pile of junk”. When I visited Thulosirubari in March 2016, almost a year after the disaster, the building was already demolished. 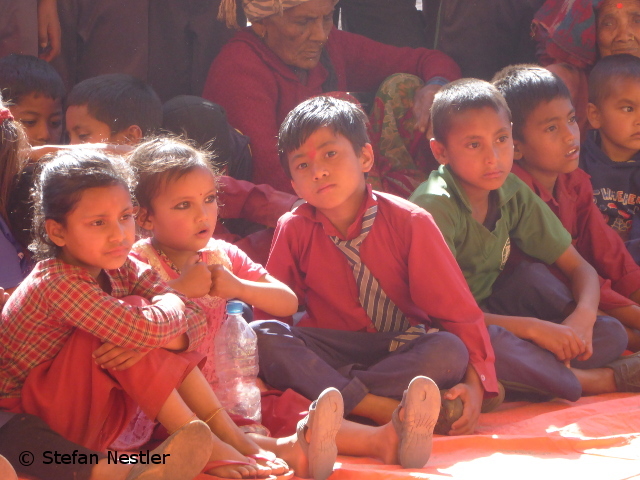 The more than 500 children and adolescents were taught in corrugated iron sheds. 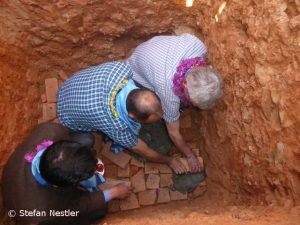 In October 2016, thanks to “School up!”, construction work began. 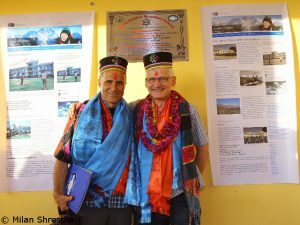 Now the first two buildings with a total of twelve classrooms are practically finished. In some places, the interior painting is not yet completed and some electrical work is still to be done. In April, the classes are finally to move to the new rooms. On this day of celebration, speeches are held for hours under a large tent roof in the schoolyard, and many documents and presents are handed over. Some dances of female students give fresh impetus to the program. The great gratitude that we experience is touching. We look into hundreds of happy faces. 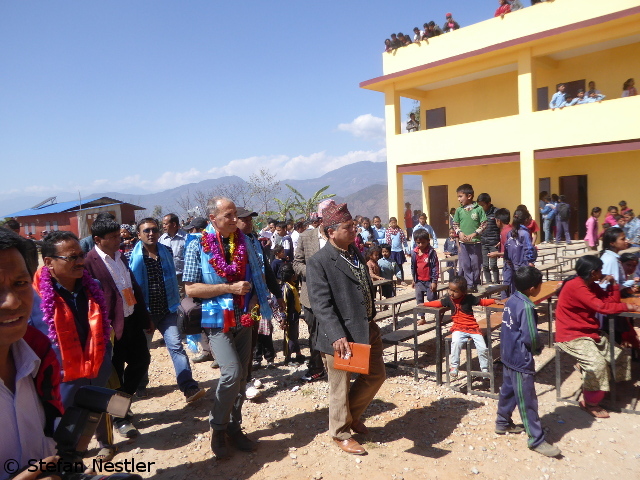 “You not only helped us, but also gave us new courage,” says Devi Dulal, chairman of the school committee. Inspired by the construction work on the new school, many Thulosirubari residents have started rebuilding their destroyed houses in the village. 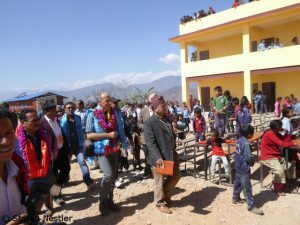 “Meanwhile, in Sindhupalchowk, work is being carried out on about 75 percent of the buildings that were damaged or destroyed by the 2015 earthquake,” says Sanjay Sapkota, who accompanied the construction of the new school in Thulosirubari as a technical advisor of the German aid organization “Nepalhilfe Beilngries”: “The government has learned from the disaster and adopted stricter building rules. They only released the financial support for new buildings when people were able to prove that they followed the new rules.” However, the governmental subsidy of 300,000 rupees per building (converted about 2,400 euros) “is just enough for the foundation”, says Sanjay. Ralf and I also lay a foundation stone on this feast day in Thulosirubari: for the second construction phase of “School up!”. 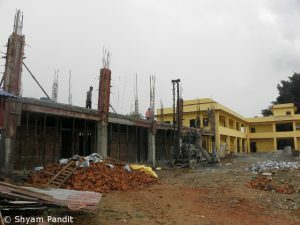 Another building with eight classrooms is to be built, and a second toilet section. “Education is the best and most important input we might get in our youth,” says Ralf Dujmovits in his short speech during the celebration. 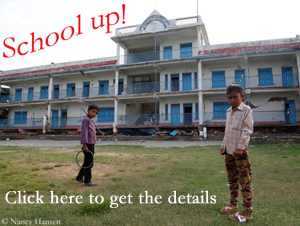 “For the future of this school, for Thulosirubari, for all the kids here I wish best of luck. You have learned to go through very difficult times – and deserve to have really good times in the future.” Like Ralf, I thank the people of Thulosirubari for the overwhelmingly warm welcome: “I carry you deep in my heart and promise you to continue to stand up for ‘School up!’” Later, when I walk for a few minutes through Thulosirubari before returning to Kathmandu, villagers from all sides greet me – not just like an old acquaintance, but like a friend. If you write this intended purpose on the bank transfer, the money will go purposefully to Thulosirubari. I will continue to inform you in my blog about the progress of our project. 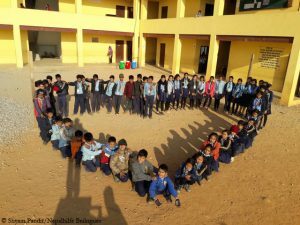 A big thank you to all friends of “School up!”. You are great! P.S. Thanks also to LOWA for the seven sacks of shoes, more than 200 pairs, which we have distributed to the children of Thulosirubari. And also to AB Sport in Cologne for the footballs, with which the school team will play from now on. If I could write a wish list for Christmas now, it would say: “Please don’t forget the children of Thulosirubari!” For two years now, the German aid organization “Nepalhilfe Beilngries” has been building the new school for more than 500 children and young people in the small mountain village about 70 kilometers east of the Nepalese capital Kathmandu. Even the darkness cannot prevent construction from continuing in Thulosirubari. 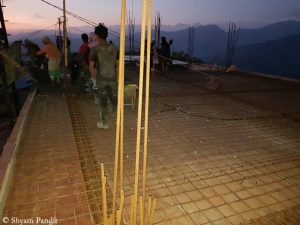 For 18 hours, concrete is mixed in the small mountain village 70 kilometers east of the Nepalese capital Kathmandu, transported upwards and distributed, then finally the second floor slab is casted. 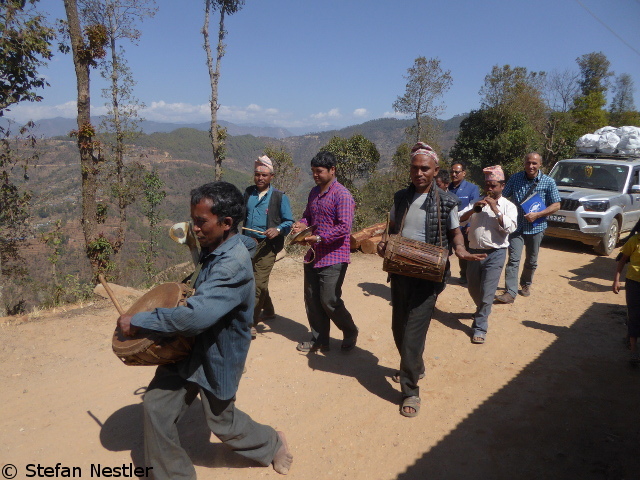 “The construction work is going smoothly,” writes Shyam Pandit, who coordinates the projects of the German aid organisation Nepalhilfe Beilngries in the Himalayan state. 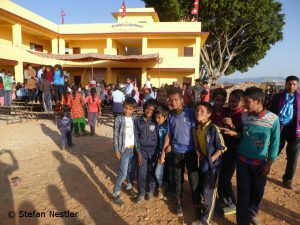 At the end of last week, Shyam once again visited the construction site of the new school in the mountain village of Thulosirubari, some 70 kilometers east of the capital Kathmandu.